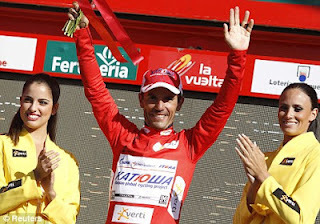 Is this year’s Vuelta one of the best cycle race ever? On the best designed course ever? Quite possibly. It’s proved far more exciting than any Tour de France that I can recall. Even Bradley’s win this year, thrilling though it was for the achievement, he did start as favourite and his win was executed with absolute precision by him and his team. This Vuelta though, who is going to win it? For the best part of two weeks it’s been anyone from the four of Contador, Rodriguez, Froome or Valverde. Then there were three as Valverde slipped away, now there’s two as Froome falters, probably knackered after his year... leaving Rodriguez who has just been awesome with Contador so far unable to break him. The BBC proposes the question, would you fib about your marathon PB? As US vice-presidential candidate Paul Ryan ‘forgets’ his. Hmmm. Well I’ve never ran a marathon and I can't actually recall my exact half marathon best but I know roughly where it’s at. I can vividly recall my 10k best but mainly because I have doubts about the validity of the course measurement! In my favour that is. For the record, having looked it up, my HM best is 01:36:22 at Nottingham 2010. I have some work to do to get back to that. A trip to Leamington tonight, to despatch Son to his new abode. Daughter leaves this week too, so then it’s just L, me and the boys again.